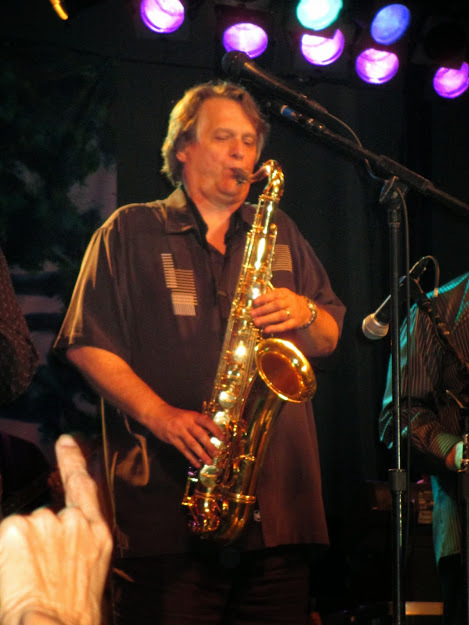 Local musician Danny Pelfrey sat in on saxophone with Tower of Power’s superlative horn section during a performance at Castoro Winery on the Central Coast of California in September 2013. 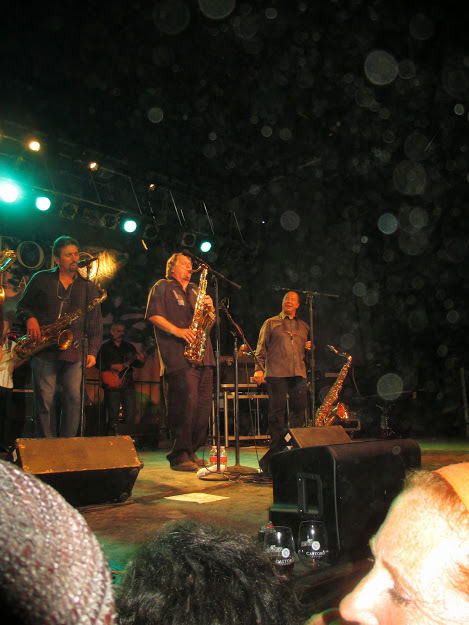 Founded in 1968, Tower of Power is known for their upbeat “urban soul music.” Danny used to be a regular member of the band, and took this fortuitous local performance for a rare reunion. Even though he no longer is in the band, Danny still executed all the synchronized, choreographed horn section moves. When meeting with Danny for this article, his friendly, humble demeanor belied his musical talents and many accomplishments, awards and accolades. While his achievements and honors are too many to mention, some of the highlights include his having won two Emmys, with a total of nine nominations. He has six BMI Awards and a Video Premiere Award for Best Video for the animated film: Joseph, King of Dreams. Danny related that he got his start playing guitar at age nine in his home state of West Virginia. He cited Chet Atkins as his first musical hero. Wanting to play with other musicians in the high school band, he took up the trumpet, on which he excelled. He wrote his first musical arrangement at age 13, and with the encouragement of teachers, he began conducting. While still in high school, he began playing with big bands and jazz groups at a local college. Danny attended the prestigious Berklee College of Music, the world’s foremost institute for the study of jazz and American music. He honed his performance skills, while also focusing on composing and arranging. He found the vibrant Boston music scene very inspiring. After accepting a teaching job in Canada, Danny started playing with local musicians. Always fascinated with different instruments, he took up tabla, a type of Indian percussion instrument, which he played during performances with a sitar player. He continued to expand the many instruments he played to include flute and alto saxophone. He was particularly drawn to sax as it had the flexibility of woodwinds and the power of brass. This is the instrument for which Danny would become best known. Danny moved to Los Angeles where he began doing session work and began touring with many prominent artists including Diana Ross, Carole King, Eric Clapton, Melissa Manchester and many others. He especially relished the time playing sax and guitar while touring the world with Carole King, as well as doing recordings and television specials with her. When asked about a particularly memorable experience, he recounted that he performed with Diana Ross during the infamous 1983 deluge of Central Park in New York City. During the increasingly heavy downpour and lightning, the band members had to flee on foot to get back to their hotel. Danny has recorded with such stellar musicians as Aretha Franklin, Smokey Robinson, David Crosby, Graham Nash, Paul Simon, Eric Clapton, James Taylor, and was a producer for Usher, Brad Paisley, Lee Ann Rimes, Ashanti, Kelly Clarkson, Alicia Keys, and numerous others. Moving to the Central Coast of California in 2009, Danny found the local music scene “very vibrant.” He noted that Cal Poly Performing Arts Center (PAC) brings in excellent quality entertainment. He was primarily spending his time composing, arranging and producing for various media. He was also playing sax with the BarFlyz, which consisted of Kenny Lee Lewis (guitarist for Steve Miller Band), Diane Steinberg Lewis (award-winning pianist and vocalist), Ken Hustad (bass), and Dean Giles (drums.) The Barflyz play pop-cabaret music including jazz, pop, Latin, Broadway and television tunes, and blues. Danny also played with the popular Central Coast band, Human Nature, which features world-inspired music, where he replace original band member, Dave Becker, who relocated to Florida. The band has a diverse repertoire including jazz, samba, funk, Americana, with some original songs written by group leader, Adam Levine, another graduate of the Berklee College of Music. Danny relatively recently moved to music-centric Nashville where he continues his many musical projects. Current Music recently added Danny’s AMUSICOM to their playlist of quality, downloadable music.